It's been SO long since I've done a Fictional Food post! My last one was back in December 2016; I made Lara Jean's Snickerdoodles. Today, I have Sour Cherry Scones! The main character (Simon Snow) is obsessed with them. 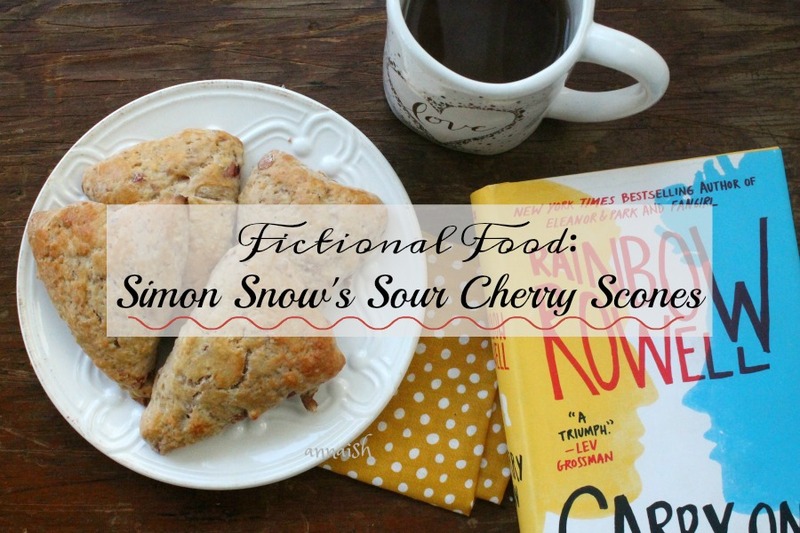 So in this issue of Fictional Food, I'm sharing my attempt at Sour Cherry Scones. NOTE: Fictional Food was inspired by my mom (she's a baker) and Stories For Coffee (she also makes YA treats). Today's issue in particular is inspired by Fiction-Food Cafe (i used their recipe!) Thank you all! It just might be me but, I find scones very tasty. I've had pumpkin, cinnamon, chocolate, and now cherry scones and I loved them! I found these scones soft (but with a golden, crusty top!!) and very filling. The tart cherries balance out the soft, heavy middle. With my buttered scones and blueberry tea, I felt right at Watford. I can see why Simon loves these scones! WANNA TRY SIMON SNOW'S SCONES? Now, my scones weren't perfect. I didn't 100% achieve that sour cherry taste. And I think I know why: I forgot to dry my cherries. I also accidentally pureed my cherries. I was a bit discouraged with myself because I was really aiming for that sour cherry taste. But, you know, I was still proud of myself. I spent at least 3 hours making (the cooking, preparing, photos etc etc) these scones!! 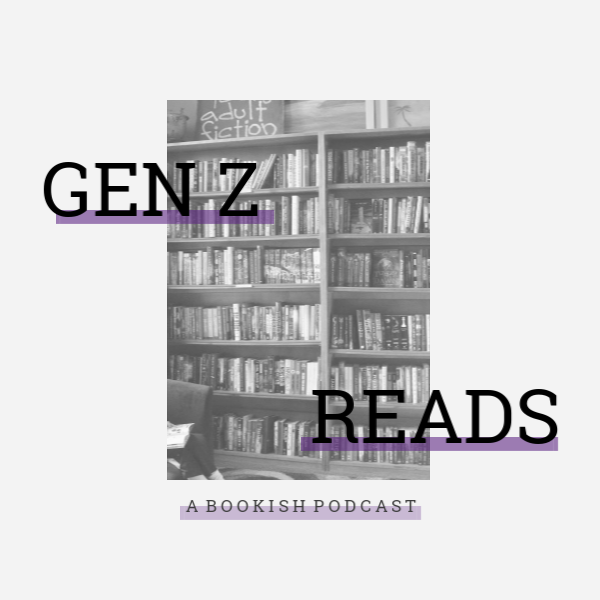 Fun fact: I've never properly reviewed any Rainbow Rowell book on annaish. Which is weird?? Because I love her books and I feel like I gushed about them all the time haha. So hi! I loved Carry On and its whimsical vibe. I really dislike when people refer to this book as Harry Potter/Draco Malfoy fanfiction because, I never saw Carry On like that. I can see WHY but the HP fanfiction idea never crossed my mind until I read other reviews. I would recommend Carry On because of the lush, magical world-building and quirky, loveable characters. And yes- I will love Simon and Baz until my dying breath. Too much? I guess so. 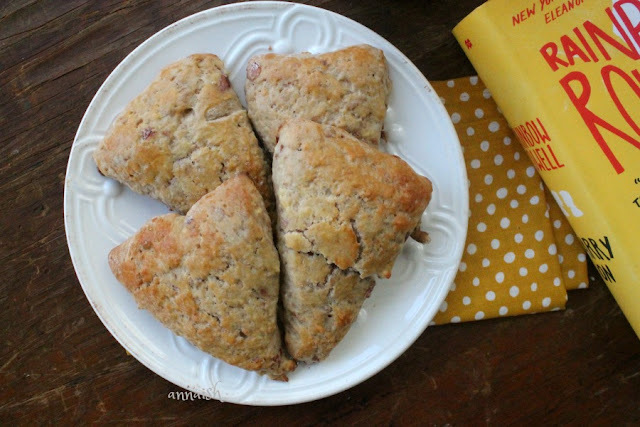 I had three great hours making these sour cherry scones and I hope you do too! Hopefully you won't be stuck in your kitchen for three hours though. As for the book ... I highly recommend Carry On for fantasy lovers! Or anyone really. 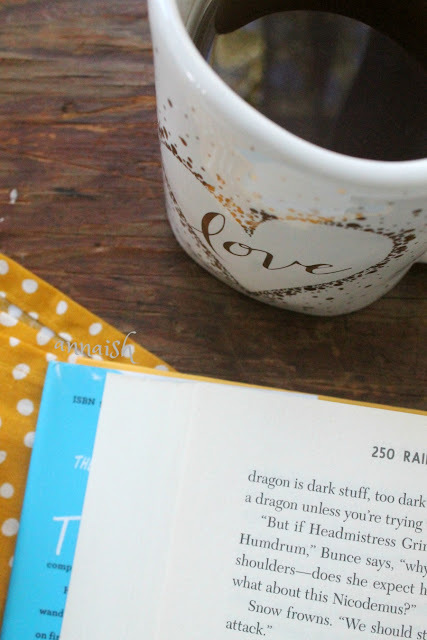 Happy Friday bookaholics! Have you read Carry On? Or any Rainbow Rowell books? Are you going to make these sour cherry scones? For Rainbow Rowell fans: Simon or Cath? Let's chat down below. Oooh, these look SO good. I love having scones (especially oatmeal honey) with my grandma. AND YES HALLELUJAH CARRY ON IS SO MUCH MORE THAN HP FANFIC. That plot twist, y'all. They are! Mmm those sound great. EXACTLY!! Anna, your scones look awesome! I bake ALL of the time, but I haven’t tried scones yet. I should maybe do some baking posts in the new year...also, I totally agree about Carry On. I mean, it’s similar to HP but it is NOWHERE NEAR fanficttion. I loved Carry On so much, especially Baz. OMG I LOVE THIS BOOK SO MUCH AND IT ALWAYS MAKES ME SO HUNGRY FOR SCONES!!! Also did hear about the sequel?? SAME!!! I would die for snowbaz. 💕 YES I DID AND I'M SO EXCITED.